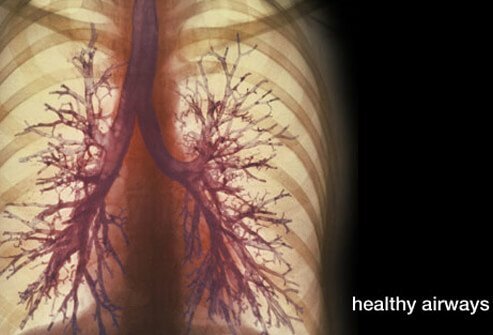 COPD vs. Emphysema: Which Is Worse? Are They Fatal? How do doctors diagnose COPD vs. emphysema? Will lifestyle changes slow the progression of COPD or emphysema? Is there a cure for COPD or emphysema? What is the life expectancy for COPD vs. emphysema? Are they fatal? The COPD acronym means chronic obstructive pulmonary disease. COPD is a general term that now includes emphysema, chronic bronchitis, certain types of bronchiectasis and by some doctors and researchers, asthma. Consequently, emphysema is a type of COPD. Not all doctors agree with this evolving terminology. People often have other types of COPD, for example, asthma, chronic bronchitis, and bronchiectasis, before they develop emphysema. Each of these types have their own characteristic symptoms and severity of symptoms, but because COPD generally progresses and worsens over time, these symptoms worsen as well. There is quite a bit of overlap of symptoms between all of the types of COPD. Doctors consider emphysema the "end-stage" of COPD, where respiratory symptoms and shortness of breath can be so severe you require constant oxygen, and it becomes debilitating. There are no differences between COPD and emphysema if you consider emphysema to be a type of end-stage of COPD. However, emphysema (or end-stage, type 3-4 COPD) has permanent destructive tissue changes seen on biopsy samples that are different from the earlier stages or types of COPD. If you consider COPD and emphysema as the same disease, there are no differences in the causes, for example, smoking, secondhand smoke, immune-mediated tissue changes, inhaling toxic substances, and/or alpha-1-antitrypsin deficiency. However, by far, the number one cause of COPD (and emphysema) is cigarette smoking. Things that make symptoms worse for all types of COPD, and especially emphysema are the same. COPD and emphysema are slowly progressive diseases that worsen over time (sometimes even with treatment). If you inhale irritants, for example, noxious chemicals or particle debris (lung tissue toxins), and/or allergens your breathing will worsen. If you continue smoking, it will cause a more rapid deterioration in your lung function and cause more severe COPD symptoms. Bacterial, fungal, or viral upper respiratory infections also will make COPD worse. If you have other health problems in addition to COPD and emphysema, for example, cardiomyopathy, obesity, congestive heart failure, pneumonia, or lung cancer, your COPD and emphysema symptoms will worsen. There are two common staging systems for COPD, the GOLD system, and the BODE index. The BODE index attempts to place your COPD into one of four survival stages based on body mass, airflow obstruction, shortness of breath, and exercise capacity by a point system. Talk to your doctor to discuss these staging systems and how they may relate tour individual problem and treatment. Using the GOLD system (as used in COPD), doctors classify COPD and emphysema as stages 1-4 with 4 being the worst or most severe stage. COPD vs. Asthma: What Is the Difference? COPD or chronic obstructive pulmonary disease and asthma are both chronic lung diseases. The most common cause of COPD is smoking, while asthma is an inflammatory response by the body. Symptoms of COPD worsen over time, but they can be treated and managed with drugs and other therapies. There is no cure for COPD. Some forms of asthma can be reversible with medication, drug therapies, and lifestyle changes. Both conditions can be life threatening. Other medications or treatments may be helpful or needed in special circumstances, for example, alpha-1-antitrypsin replacement, or mechanical assisted breathing for a short time). Your doctor may recommend surgery to reduce your symptoms and/or to help restore some of your lung function. Surgical procedures your doctor may discuss with you include removing the nonfunctional air sacs in your lungs (large bullae) to decompress lung tissue, lung volume reduction to decrease lung hyperinflation, endobronchial valve placement, and lung transplant. You and your medical team (primary care, pulmonologist, and surgeon) will discuss what treatments would be best for your health care. It is possible to slow the progression of COPD/emphysema by quitting smoking, medical and/or other surgical treatments, and physical therapy. However, even with aggressive and appropriate treatment often COPD will progress. Symptoms and complications can be treated and managed, however, here is no cure for COPD/emphysema. The life expectancy can be estimated for COPD/emphysema by the BODE index previously mentioned. However, it is not possible to determine accurate life expectancy for these patients because of so many variables that may change. Nonetheless, types 3- 4 COPD/emphysema puts you at risk for many serious or fatal complications like pneumonia or heart failure. For this reason, some doctors consider types 3-4 COPD/emphysema to be a life threatening disease. Mosenifar, Z. "Chronic Obstructive Pulmonary Disease (COPD)." Medscape. Updated: May 02, 2017. Boka, K. "Emphysema." Medscape. Updated: Aug 31, 2016. Please share your experience with COPD or emphysema. What symptoms do you experience with COPD or emphysema? What things worsen and irritate your COPD or emphysema? What treatments and lifestyle changes have been effective in managing your COPD or emphysema? Pneumonia is inflammation of the lung usually caused by bacterial or viral infection (rarely, also by fungi) that causes the air sacs to fill with pus. If inflammation affects both lungs, the infection is termed double pneumonia. If it affects one lung, it is termed single pneumonia. If it affects only a certain lobe of a lung it's termed lobar pneumonia. Most pneumonias are caused by bacteria and viruses, but some pneumonias are caused by inhaling toxic chemicals that damage lung tissue.